A lovely card from Helen and Will arrived whilst we were in Ireland this summer. Paddy’s Whiskers played a wedding ceilidh for them back at the end of May at Dartington Hall, Devon. Makes it all worth while! Summer Is Here…The Whiskers are Busy! It’s busy season for Paddy’s Whiskers – we are now full booked until mid-October and the diary for 2016 is filling up. The sun is shining, love is in the air, and we are enjoying making ceilidhs and barn dances for lovely couples across Devon, Cornwall and Somerset. Paddy’s Whiskers are full time professional musicians – we are equally at home performing for concerts as we are playing barn dances or ceilidhs. When we are not gigging then we teach music – violin, banjo, mandolin, guitar and octave mandola. 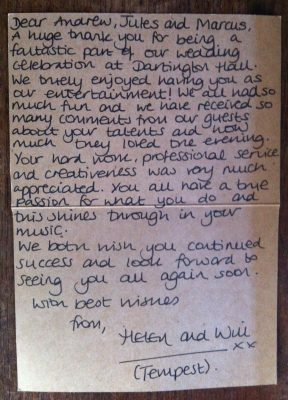 When you book the Whiskers for your event, you can be sure that you’ll get a great party – we specialise in giving everybody a night to remember – and we are friendly, funky, efficient – we dress well and we look to make a cool contemporary vibe whilst playing footstomping traditional music. If you’d like to catch us live we’ve a big public barn dance at Occombe Farm, Paignton on 4th July. Tickets are available from this link. “You played at John and I’s wedding on 6th December. Sorry it’s taken us a while to get in touch -life’s been totally hectic. Just wanted to say a huge thank you. You and the band were unbelievable – we absolutely loved you as did everyone else. Apologies for the rowdy rabble – they had a great time and sooo many people have told me how perfect you guys were and how much they loved you. Great muscians, great with the crowd and really good fun. You set exactly the right tone to finish a brilliant day. Ive never ever seen so many people want to dance at a wedding and although it was chaos it was brilliant!!!! Best band ever! Thanks so much you were honestly the perfect end to our day we can’t thank you enough. Thank you Ali and John….it was an amazing night…. “Wicked Night, Wicked Band.” Happy New Year!! Thanks to everybody who came and partied! It would not have been the same without you! Don’t forget we are playing at The Boathouse again on Sunday 8th February at 2pm. No tickets needed but you might want to book a table!